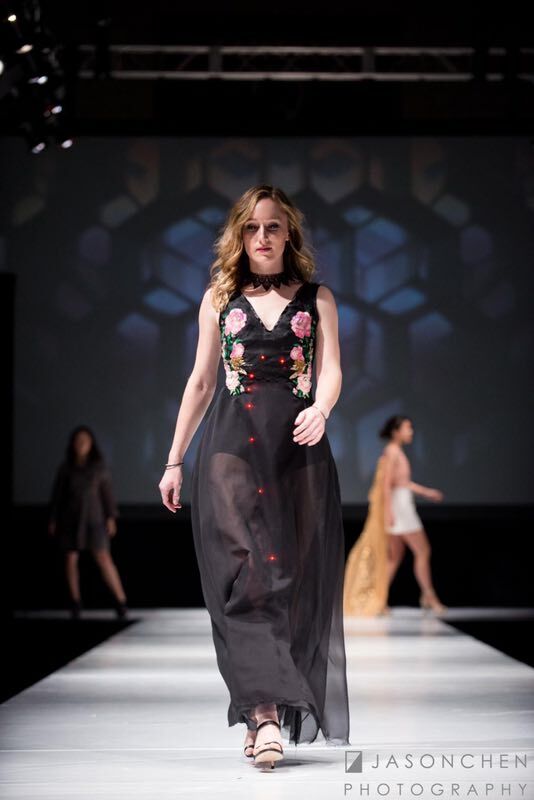 Fashion forward became an entirely new concept to me these past few months as I dipped a toe into the magical world of LED lights and fashion -- clothing that light up the stage. 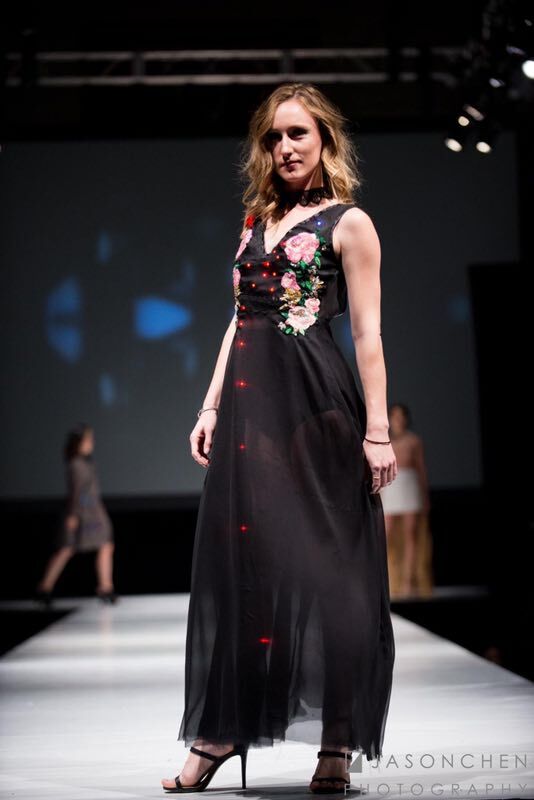 The past two months, I helped my friend Pauline put together a gown for a fashion show -- not just any gown, but one that entailed intense, numerous hours of combining the old world practice of hand embroidery with new world technology of wearable mini LED lights sewn right into the dress. Pauline designed, drafted, and sewed the gown, she also designed the embroidery, taught me how to embroider, and MacGuyver'd a way to wire and affix the lights to the dress. She was a one woman fashion tornado, and the result was breathtaking. 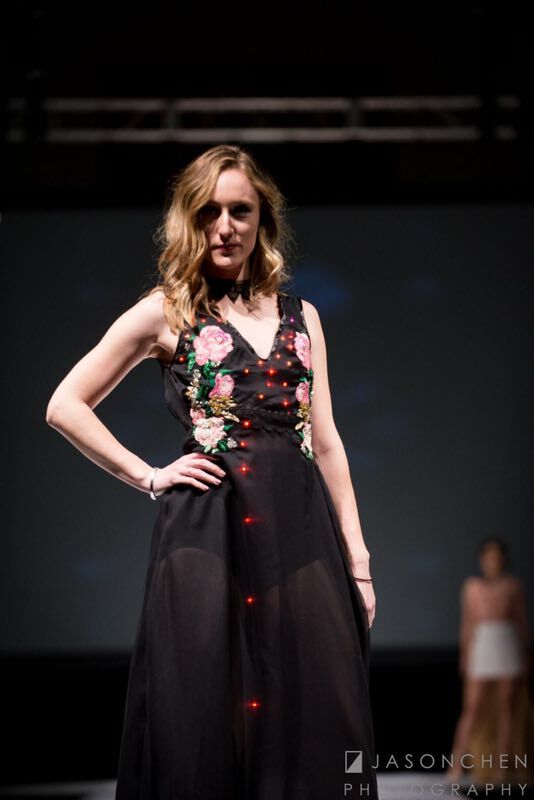 All of our hours of late night sweat and tears (and blood from poking ourselves with needles) really paid off as Liz walked down the runway with lights twinkling and sequins sparkling. It was enchanting and unforgettable. I had a little Q&A with Pauline about this project. What is the Lunar Gala? How did you become involved in the show? Lunar Gala is student run fashion show at Carnegie Mellon University, where I went to college for several years. I think it started off as a mostly Asian student organization run celebration of Lunar New Year, with student designed clothing collections (of 6-8 outfits) featuring traditional themed performances like the Lion Dance in-between lines. Over the years, its evolved to be more sophisticated (this year there were huge LED screens with projections), and progressively less about Lunar New Year. The show just celebrated its 20th year running, and I think it’s now the largest non-fashion school show in the US? I got involved in Oct 2008, for the February 2009 show. I had attended the show the year before, and was blown away with how cool the designs were and how much people were able to achieve not only creatively but technically as well. I think the show I attended had some dresses made fully out of sheet metal? It was crazy and amazing, and as someone who was starting out in fashion design, I knew I had to get involved. Ultimately I made an 8 piece collection based around flowers and floral prints, and received great feedback which really gave me confidence about starting a career in fashion. This year, my friend told me they were starting an Alumni Association for LG, and wanted to debut an alum designed line within the show. The idea was to bring back involvement from alums and encourage them to donate back into LG, in order to give scholarships and mentorship to current students. Since LG had made such a big impact on my personal career choices, I applied to showcase a dress and was accepted as one of 10 alumni designers. My intention was to show current students what the possibilities for the future were, and offer myself up as an advisor if they needed help with their own works. What inspired the concept of your design? As it turns out, my concept was based upon the most recent MET gala show theme, Manus x Machina, a combination of past and future technology in fashion and its impact on the industry. This boiled down to an interest in a gown inspired by the digital age that would showcase old technology (ie. embroidery) and new technology (i.e. conductive thread and LEDs). My design was rooted in the idea that as we increasingly become dependent on the digital world, it has become like a vein for society... a lifeblood almost. I wanted to create a dress that encompasses both traditional and digital elements, with an Arduino server in the center of the bodice that will represent the "heart" and led veins leading out of it. I included embroidery of flowers on the bodice as a nod to my original collection for LG. 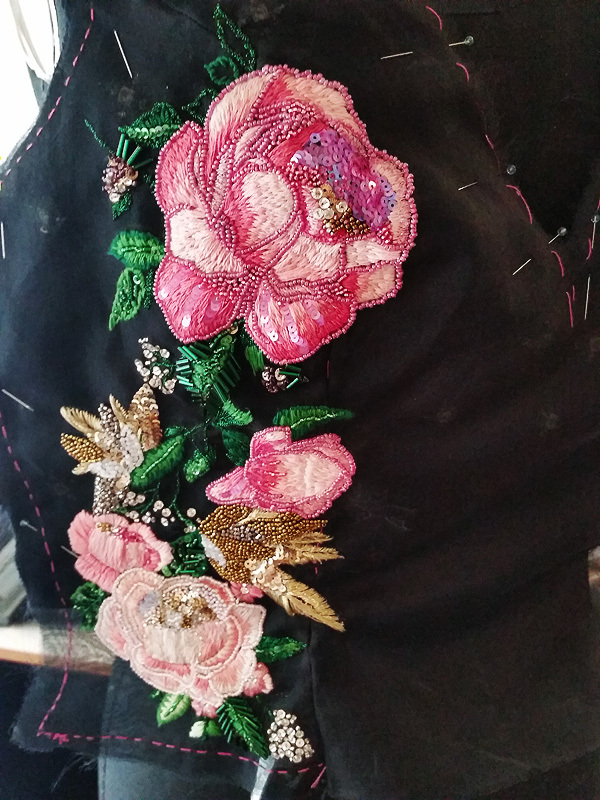 Where did you learn to embroider and how did it fit into your vision for the gown? I’ve always been interested in the delicate handwork embroidery used by couture houses like Chanel and Dior and Elli Saab. 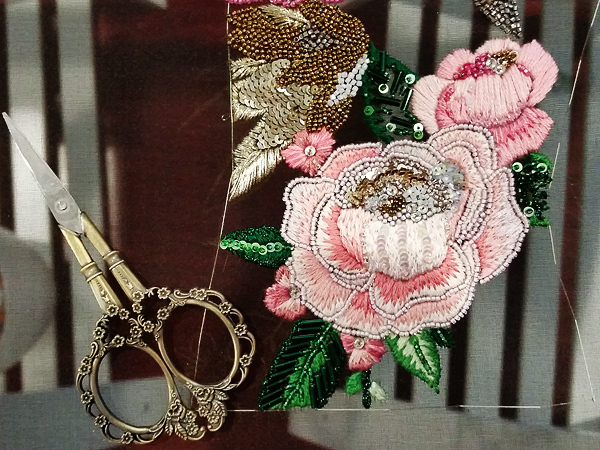 I learned the basics of the type of embroidery they commonly use, known as Lesage embroidery or tambour embroidery, in which a thin needle with a hook is used to sew beads onto taut fabric in a frame. Once I had exhausted the resources I could find online, I looked for schools that taught this old art and ultimately took a class at Ecole Lesage, based in Paris, last summer. In the short amount of time I was able to study there, I realized that embroidery was not only my passion but something I am extremely proficient at. This all fit into my vision for my gown since it would be the most “couture” element of the dress, and would show off a set of more traditional dressmaking techniques. What was the most difficult part of constructing this garment? For me, the most difficult part of constructing this garment was making decisions on what was feasible to make given time constraints as well as what I was able to do with my limited knowledge of electronics. There were obviously a lot of new techniques to me that I had to learn quickly, like how to wire the electronics and how to program the Adafruit chip. How have your designs evolved from the time you went to school to now attending as an alumni? I think my designs have evolved in subtle ways since college. I think now I am more aware of what is flattering for body types and what style lines will emphasize the curvature of the form. I think my taste in fabrics has also refined — I’m much more willing to use bold prints and other fabrics I might have not been comfortable using before. This is all due to an increase in technical knowledge on clothing construction and design — the more I know about how things are supposed to be made, the more ability I have to fiddle around and see if I can do things differently. ...And now, watch the gown in action! 9 comments on "Lunar Gala: Illuminating the Runway"
Wow you are talented! The embroidery is beautiful. The lights are pretty cool too! That dress is gorgeous!! Well done, it must be so nice for you and Pauline see your work so beautifully exhibited! 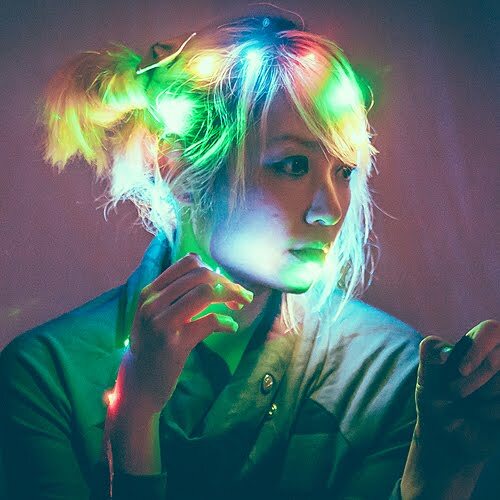 I'm very intrigued as to how you got the LEDs on the dress - fascinating! Great post! What a stunning dress! So pretty and feminine looking, and the flora details are simply gorgeous. That is such a neat idea! I love that!! Plus its true - the embroidery and lighting really is beautiful.